This is one package pinout of TPS7225QPWRG4,If you need more pinouts please download TPS7225QPWRG4's pdf datasheet. 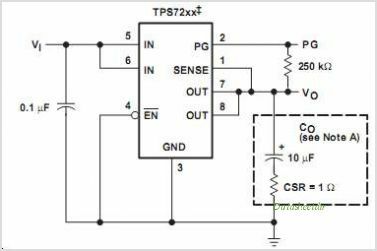 This is one application circuit of TPS7225QPWRG4,If you need more circuits,please download TPS7225QPWRG4's pdf datasheet. LP3999, Low Noise 150mA Voltage Regulator For RF/Analog Applications.